This article is an extended version of one Keith wrote for Canon Europe (issue 11). It is aimed at showing some of the basic principles involved in digital black and white photography. 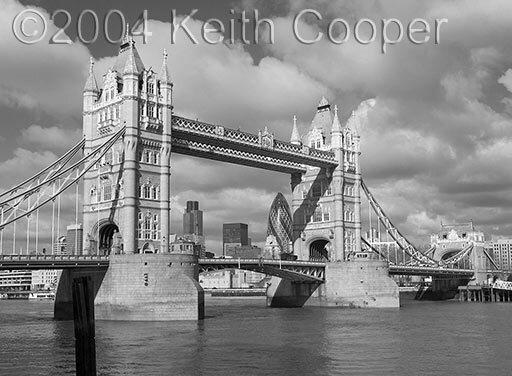 The quality of conversion to B&W is discussed later, since if you are going to be producing the best black and white prints, the conversion technique can make quite a difference. Note – this is one of our oldest articles on the site – software and cameras may have advanced, but none of the principles of what you’re trying to achieve have changed. Black and white goes back to the very origins of photography. Early plates and films had limited sensitivity to longer (red) wavelengths of light and produce a certain interpretation of the subject. Later films had a much more even response to colours (panchromatic) that led to a different ‘look’. The differing chemistry and manufacturing processes adopted by various manufacturers resulted in different films producing subtly different renditions of the same scene. It was soon discovered that using coloured filters in front of the lens also altered the image. For example, a red filter cuts out some of the blue light from the sky while still letting through the red component of the white light reflected from clouds. This results in darker skies, which emphasise the clouds. More complex mixtures of colours, such as flowering plants and skin tones, would all look slightly different on different films and with different filters. 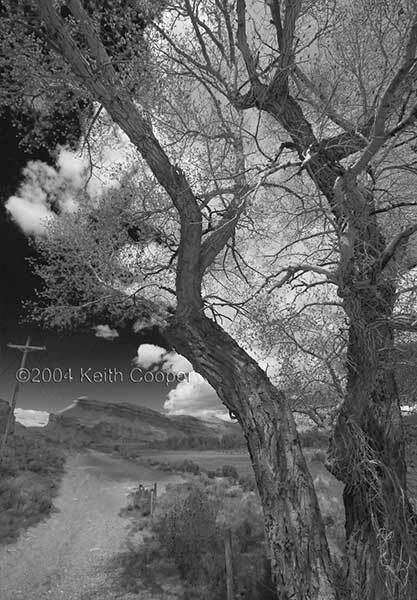 OK, so I have my digital camera and want a black and white picture of a landscape, with dark skies and fluffy white clouds, what do I need to do? Some cameras do indeed have a black and white setting that might be worth a try, but I’m looking a getting the very best out of my camera and want to use ‘raw’ images, just the same as I would with colour. The black and white setting gives you 8 bit black and white JPEG images. If you shoot raw and JPEG at the same time you’ll find that the raw files are still in colour. I’m going to be looking at converting the raw files to colour and then to black and white. The examples all used Photoshop CS for raw conversion and subsequent image processing. You could use other raw converters and photo editors just as well. I compose and take the picture just as if I had black and white film in my camera. Well not quite, with film I might select a filter, maybe a light orange filter – red often looks too much like moonlight. With digital I can still apply the equivalent of a coloured filter for black and white, but I’m going to do it later with Photoshop. I also have the advantage of changing my mind if I decide, for example, that a yellow filter would have been better. It is true that the process is not quite equivalent, but certainly very similar. For all of the conversion techniques I’m going to describe, I’ll assume that you have a well-exposed RAW file with very little clipping of highlights. It’s quite OK to experiment with your camera’s black and white mode, if it has one, but the JPEG files will not reproduce the full range of tones you could get from a processed RAW file. By all means experiment with any pictures you want, but starting with good colour originals allows you to see the effects of different conversion processes more easily. Digital cameras are thought of as recording scenes in pixels of red, green, and blue. Actually each pixel is sensitive to a range of colours and has a little coloured filter in front, so it is more accurate to think of each one contributing to a grayscale image (a channel) representing values of mostly red, mostly green and mostly blue. Very simple, but you are throwing away a lot of your picture information, and for the best quality, that’s not really what we want. Change the mode to Lab: Image>Mode>Lab Color –then delete the ‘a’ and ‘b’ channels, and change the resulting Alpha channel to Grayscale. 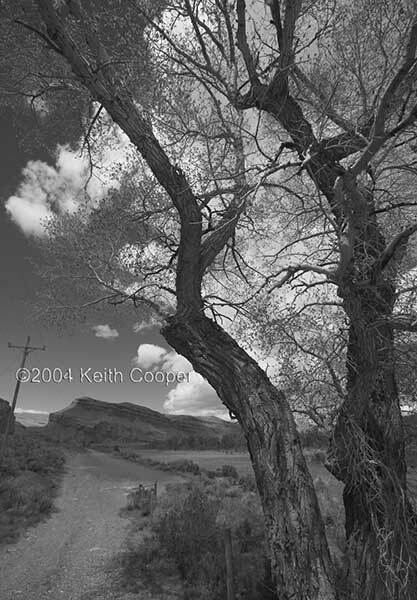 Update: Photoshop now includes a more detailed B/W conversion option, which is like a more complex version of the Channel Mixer approach described later – very easy to use, but still following the basic principles outlined in this 2004 article. Similar tools exist in most image processing software, such a Aperture, Lightroom, or even iPhoto. 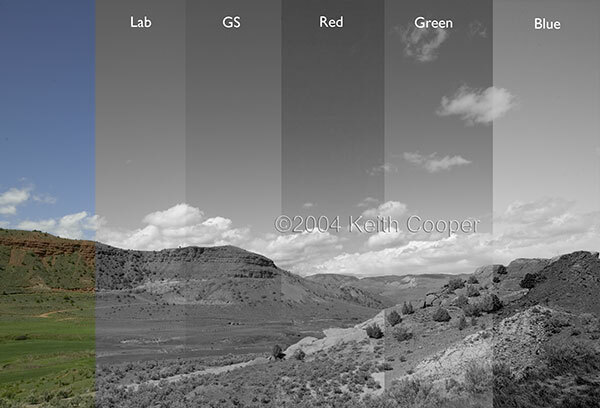 The Lab, Grayscale, Red channel, Green channel and Blue channel processes are compared in this Wyoming landscape. If you move your mouse pointer over the picture, the coloured original will be revealed. Update – 2009 If you would prefer a slightly more automated (but still very flexible) method of converting to black and white, do have a look at the lengthy reviews of Nik SilverEfex Pro and Nik Silver Efex Pro 2. 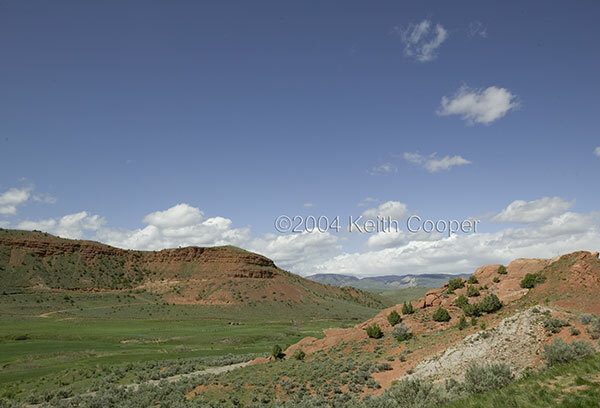 They include examples based on the Wyoming image above. I actually use the Nik software quite often for my own large B/W prints. What if you mix the 3 different colour channels as greyscale images? Easy to do, with a ‘Channel Mixer’ adjustment layer. Note the ticked monochrome box. The percentages are the proportions of the different channels that are being mixed. They do not have to add up to 100% but it is a useful starting point. This method allows you to fine tune the conversion to emphasise different aspects of the coloured original. Remember that something like ‘blue’ does not really equate with any particular shade of gray, it is how the tone relates to others that gives the effect. Although very powerful, you are mixing just three channels and there are times you may want finer control. Other conversion techniques often have more sliders for different colours. 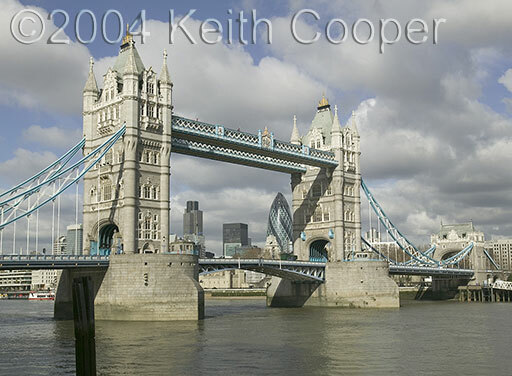 A very simple technique (used in the second Tower Bridge picture) involves just two Hue and Saturation (H/S) adjustment layers. Create another H/S Adjustment layer with Saturation at minus 100. The Tower Bridge picture had Hue -36 and Saturation +42. Even more detailed control is possible by using different edit selections in the adjustment dialogue. This allows you to select which colours are altered by differing amounts. This picture of a cottonwood tree was taken in Wyoming. The second version shows an ‘Infra-red film look’ that uses settings of Hue +19 and Sat +75 but has the blending modes reversed (first layer ‘normal’, second ‘color’). I found the second ‘Infra Red’ technique accidentally, when experimenting with blending modes. Remember that there are no ‘right’ ways of getting your black and white image and it is well worth trying different options. You could for example try a H/S layer with a channel mixer layer (monochrome) above it. I’ve only listed some of the simplest methods here. You can combine them, mask them and generally spend a lot of time ‘getting it right’ if you want. There are a number of third party plugins available for Photoshop, some of which even aim to mimic the responses of particular film stock. I know that many people will just go for plugins like Silver Efex pro, or the black and white conversion options in Lightroom/Aperture/Photoshop, but if you really want to understand how different colours and brightnesses affect the resulting images, then take a bit of time to explore some of the ‘old fashioned’ approaches. 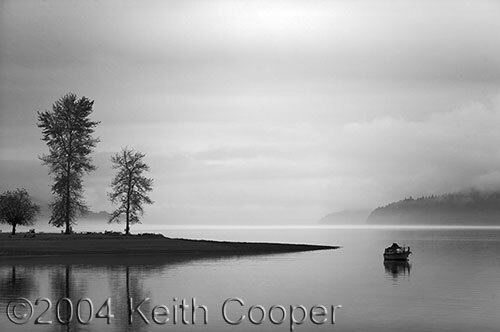 I’ve got a collection of many of the methods I’ve found on the B/W conversion page. You can also try conversions directly in Adobe Camera Raw, by setting the saturation to –100 and altering the other settings under the ‘adjust’ tab. 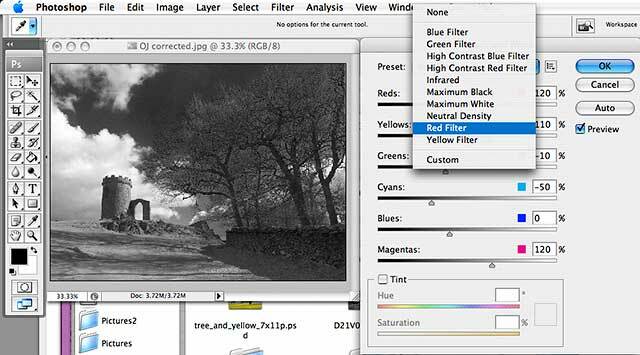 Update – Photoshop has greatly improved its B/W conversion options with a specific adjustment that allows fine channel adjustments to be produced. This is also available in Camera RAW, however I usually prefer to do the conversion from a colour image I’ve opened in Photoshop. Seeing results on the web, there may not look too much difference between the techniques, but when you are looking to make high quality prints, there are some other considerations in deciding which to try. Work in 16-bit mode if possible. The image of the Hood Canal photo at the start of this article would have been seriously posterised (visible banding) if I’d worked in 8-bit. Any method that pushes saturation of an image too far is likely to show artefacts. This is particularly true at high camera ISO speeds or with compressed (JPEG) original images. The Tower Bridge layers example and first cottonwood conversion, both use more saturation than I would normally use for prints. This was mainly so as to show the effects more clearly in this web article. One area that is often neglected is the colour image that is converted. There is nothing to say the colours have to be ‘correct’ before you convert. I sometimes use DxO optics Pro to process my raw files, but turn up some of its adjustments and controls beyond what I’d want for a good colour image. When converted to B/W I can sometimes get a better B/W image. Image noise may be more noticeable in some channels. The red channel often shows this up, particularly in deep blue skies. With my landscape prints I sometimes use the Lab method since it seems to give files that are easy to work with and take large adjustments well. As with most of these things you should experiment and see what works best for your images. Welcome to digital black and white!